So you finally made the decision to go mobile, and you’ve just spent some time getting acquainted with QuickBooks Online. Moving to the cloud will obviously change the way you work — for the better — and give you new flexibility and accessibility. You’ll also be able to be more responsive to your customers — something they will likely notice and appreciate. Before you start entering multiple records and transactions in QuickBooks Online (QBO), it’s best to know how to navigate within the site. I’ll help you by providing a few tips. I want to start by showing you how to use multiple windows, which will greatly improve the efficiency of your workflow. You might want to use this feature to reference another part of the site while you’re working in the original window. You can open new windows directly from the browser window you’re working in by clicking CTRL + N (or, on a Mac, CMD + N). Depending on the browser that you are using, you’ll get different results. With Internet Explorer, you’ll be logged into a QBO screen. 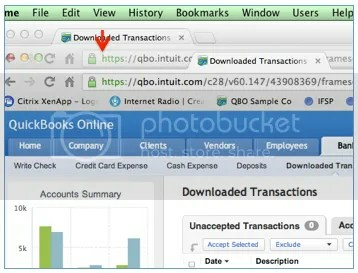 In Chrome or Firefox, you would just need to type in the QBO URL — no need to login again to any of these new windows. Here’s another way to do this in Chrome (which is the recommended browser; it tends to be faster than the others). 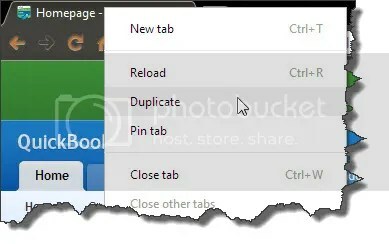 When I need a new window, I prefer to right-click the Chrome tab representing the window I’m in, and then click Duplicate. A new window, identical to the current one, will open. Figure 1: QBO makes it easy to open a duplicate window. QBO uses a series of tabs within each window to help you navigate through the site. Each tab — Clients, Company, Employees, etc. — gives you access to a related group of features and tasks. You don’t need to actually click on each tab to access its sub-items. Simply hover over the tab in the QBO menu ribbon and click on the feature you need. Clicking on a QBO tab defaults to the item on the farthest left, but you can mouse to the correct one. Click on the Customers tab, for example, and the Customer Center opens. To customize the positioning of your sub-items on the menu ribbon, you can hover over More on the sub-item ribbon with the desired tab highlighted and choose Rearrange Menu from the drop down list. Figure 3: You can set up your navigational tools to work the way you do. QBO also offers a couple of ways for you to learn the ins and outs of the site, which you can reach via the Home menu tab: the Getting Started page, which offers numerous instructional videos and a downloadable Getting Started Guide. There’s also a link to a graphical flow chart illustrating the features available in QBO. If you didn’t complete setup before you first started using QBO, you can always return to the Setup Interviews. Click on Company | Preferences | Company | Setup Interviews. We’ve learned that these few tips can make your initial experience much easier. Learning how the interface works simplifies and accelerates your workflow and reduces the learning curve. Now that you have the tools to master the basics of navigating in QuickBooks Online, you’ll be ready to customize the product and set your preferences. Please let us know how we can help. Come see all of what Business Pros of Kansas City can do for you and your business.